Budwig Company is an Original Equipment Manufacturer (OEM) and not a distributor of other brands of Plastic Feet or Plastic Bumpers. When it comes to Plastic Feet | Plastic Bumpers, no other company offers higher quality Bumpers at affordable prices as offered by Budwig Company, Inc.With more than 50 years of experience and expertise, our company has made a mark in the industry by providing plastic feet and bumpers to a wide range of clients all across the globe. Plastic Feet, also known as Plastic Bumpers are molded from “Thermoplastic Rubber”. 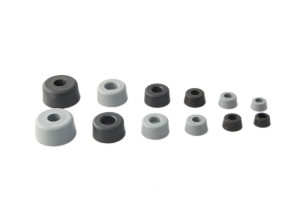 Thermoplastic Rubber Feet, Budwig Bumpers offer better traction, better shock absorbing qualities, greater resistance to stress cracking, and have excellent non-marking qualities. Our Plastic Bumpers and Feet stock colors are Black or Medium Grey and are also available in any color on special order. All Budwig products are manufactured at our facility in San Diego, California. Our company manufacturers a large a variety of Plastic Feet / Plastic bumpers including Round TPR (Thermoplastic) rubber bumpers, Square TPR bumpers, Rectangular TPR bumpers and an assortment of Miscellaneous TPR bumpers. With innovation and the right blend of technology our Plastic Feet are designed and engineered keeping the contemporary demands of our customers in mind without sacrificing any of the excellent workmanship in our products. Budwig Company has the best to offer HANDS DOWN when it comes to Plastic Feet | Plastic Bumpers. Plastic Feet | Plastic Bumpers at Budwig Company are manufactured using Santoprene™ Thermoplastic Rubber (TPR). Santoprene TPR allows us to provide our customers with bumpers that possess superior properties at a much lower cost. Feel free to contact us at your earliest convenience about any questions or concerns regarding our Plastic Feet | Plastic Bumpers.